I’ve been reading works in which Petersburg is mentioned for the past few weeks in order to prepare for this amazing city. It’s been fantastic reconnecting with my love for Russian literature, but things have been feeling slightly off. Every time I walk somewhere, I am just in so much awe at the beauty of the buildings, at the amazing way in which the sun sets a golden light on each and every building late every evening, at how every single canal draws you in and makes you want to stop on the bridge and stare at the water for a long time. By a new queen when her time comes. “The dawn after the sunset hastens – / And a half-hour’s for the night.” – Griboyedova canal in this magical half-hour of the night. Pushkin’s words strike a chord for me because Saint Petersburg feels so incredibly royal and graceful. Every single building in the center looks like it was at some point inhabited by some famous writer. It is so beautifully maintained, that it does look a bit stern, yet still so elegant. His description of the White Nights – how accurate! It has been harder to rest at night, the light outside invites me to write, to read, to be awake until midnight when the sun finally sets only to rise again after a short while. 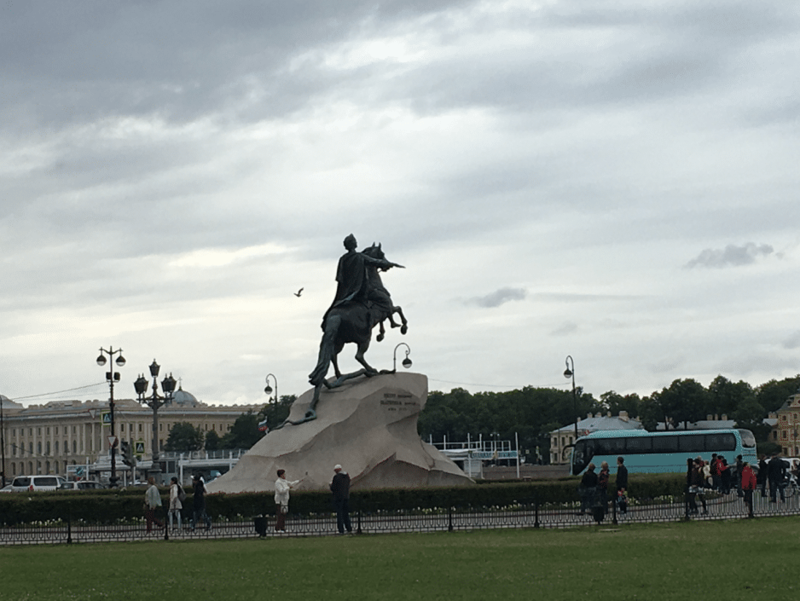 This passage of the Bronze Horseman is the best expression I have found so far of the way I feel whenever I venture out into the middle of Petersburg – pure awe and love of this city, and an overwhelming feeling of gratefulness at the opportunity to marvel at Peter’s great creation. The windy, rainy day when I chose to read Pushkin’s poem was also a perfect time to go out and find the real bronze horseman. The name of the poem refers to a statue of Peter the 1st, commissioned by Catherine the great, lying just behind St. Isaac’s Cathedral, on the banks of the Neva. I call this day perfect because the poem tells the story of a deathly storm in Petersburg, so going to the statue on a sunny day would have probably felt dissonant. I was there only briefly, as I was rushing to class, but as many of the other places I pass by in Petersburg, the Bronze Horseman left me hungry and longing to match more places to their literary descriptions. 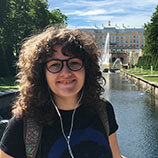 Iulia Iordache-Bryant is a proud 2015 alumna of Grinnell College where she studied Psychology and Russian. Today, she works in student affairs at a liberal arts college supporting other students like herself in Singapore. In her free time she crafts, journals, and reads. Russia and its culture have always fascinated her because she wants to understand more about the Slavic influences on Romanian people. She feels that, as an Eastern-European woman, coming to Russia and learning Russian were essential to understanding more about her heritage. She has fallen in love with Saint Petersburg and hopes to come back to visit during winter someday.